"I mean, I am just a dumb bunny, but we are really good at multiplying." That's an excellently hilarious quote from Ginnifer Goodwin in Zootopia, one of the best animated films of the 21st century. Goodwin plays Judy Hopps, a bunny from the small town of Bunnyburrow who dreams of becoming the first bunny cop in Zootopia. After a lot of training, she becomes the first bunny cop. 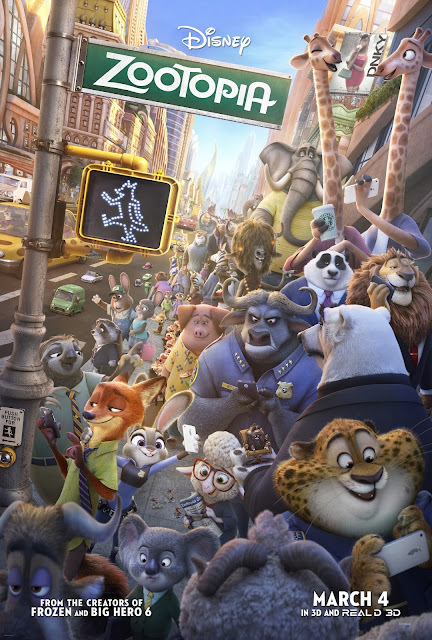 She is looked at with disdain by the other cops, & she is assigned parking duty by Chief Bogo (played by Idris Elba). During a shift, she meets Nick Wilde (played by Jason Bateman), a con man. She abandons her post to go after a thief who only stole onion bulbs, & is reprimanded by Chief Bogo. Judy then finds out about 14 unsolved missing mammal cases, & she & Nick team up to solve the cases, eventually uncovering something a sinister plot to destroy the predators who try to kill their prey. The film was excellent. Goodwin & Bateman were great, & they had a lot of chemistry together. Elba was menacingly good. The direction from Byron Howard & Chris Moore was great, along with the screenplay by Jared Bush & Phil Johnston. But the best thing about it were its themes of prejudice, police bias & stereotypes, which reflect well with today's society. It's sad that those are all too prevalent in society today, & it's up to us to end it. Overall, it is an excellent animated film with excellent themes.